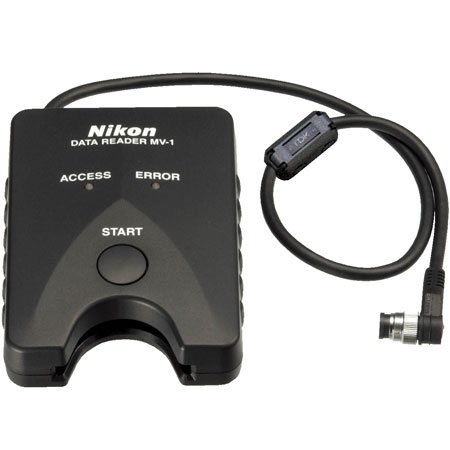 The Nikon data reader MV-1 enables a photographer to write exposure and lens data from the camera to a (CF) compact flash memory card. Memory cards should be formatted by a PC using FAT12, FAT16 or FAT32 file systems, as the MV-1 cannot format memory cards. This device cannot be used with cameras other than the Nikon F5, Nikon F6 and Nikon F100 SLR cameras, even if they do have a 10-pin terminal. The MV-1 does not offer a function to transfer data to a PC. Once written to the memory card in the MV-1, shooting data cannot be transferred back to the camera or displayed by the camera. The camera model (F5, F6, F100) is automatically detected and the camera model folder name automatically set. After uploading to a PC the data can be seen in the exif data in Nikon View. The data file can be opened in a spreadsheet application like Microsoft Excel to ease readability. The MV-1 is powered by the camera in use. One should connect the MV-1 to a camera when the camera is off and loaded with a film.